Ron Scott or Chet, Recognize da buildens? From the DNR gal I got this from: "I sent the first one to our wildlife crew asking if the guy came in for a deer check. They sent me back the two photos and said, "as a matter of a fact, he did!" They had never seen the first photo and I had never seen the two they sent me--we got them from different sources." He must have made the local newspapers there. The buildings and street does look somewhat familiar. Geez! The deer in Yooper land must be lighter or the men stronger! I am sure the deer must be lighter. Perhaps CWD? Boy I thought some of us hillbillys looked funny strapping our deer on our four wheelers to get them to the check in station. That guy is insane to ride like that . Some slobs down here might think the deer was still alive and shoot him in the process. Man you wont find me in WV in deer season now! You should get them boys eyes checked down ther, the round legs, houses, cars and blacktop road would be a clue to most hunters up hear. My guess is that he must be down south in the Stephenson area cause it don'T look like he has SNOW TIRES on his bike . "Put on the lard and Onyons honey, I'm gonna gut you a Buck!" Pardon me, but there are some things about this thread that I don't understand. I hope you don't mind me asking, but is a yooper a person from Michigan? If so are they from Upper or Lower or either? I'm a little confused about what it is in the picture that identifies this person as a Yooper. We have lots of people here that ride bikes, but they are mostly kids. We have lots of people here that wear fur, but they are mostly women. We have lots of people here who check in deer, but they are mostly city dudes. What's a Yooper? Jeff told me once. Upper Peninsular=UP=yooper, a Mich. term. I was in Michigan a few years ago, I pronounced it "yaper" and was corrected. It is pronounced "youper"
The true pronounciation is youuuuuuuuper. It sure is lonely UP here being the only youuuuuuuuuper on the member map so far. I'm surprised Ron didn't get it . The first pic looks to be the Nat'l Guard building on carpenter ave right by Nelson Paint in Iron Mountain. But the second looks like the old business district of Kingsford. He has to be on his way home, or he's going the wrong way , cause the DNR check station is way on the other end of town. Never had a deer come into one my check stations that way. At one of the early elk hunts a Native American had drawn a permit. He and some members of his tribe shot an animal west of Atlanta. Having no way to load it into or on top of their old van they hooked a chain around its neck and drug it to the Check Station at the Atlanta Field Office which was about seven miles from the kill site. There wasn't much hide left on the bottom side. After we checked and weighed it we loaded it on to the roof of their van with the tractor and they were off. If I can get my criter neer a frount loader or even a good 4X4 truck (dont spin the tires) I peel the hide off and get a beter faster job that way. It works great with Mule Deer, Elk and Sheep, have not had a chance to try it with moose and have never lived around Whitetail Deer but I dont see why it would not work the same way. My sister-in-law worked at that big hotel on that big island near that big bridge up there. I can't remember the names. She was talking about fudgies, but I don't remember what she said. I doubt I need to know anyway. I already know a lot more stuff than I remember anyhow. By the way, on some other thread you asked If I'd heard some song by someone on a couple of guys show. No I never heard of any of them. We have a TV but I hardly ever watch it because it doesn't work. Your kodacs enabled me to figure this whole thing out----- those yoopers and fudgies are just subspecies (or do you consider them mutations) of damnyankees. Right? O.K. Hear is an explanation of terms. A yooper is a resident of Michigan's Upper Peninsula. You pretty much have to be born there to be a real Yooper. Just living there is not good enough, although in some instances if you have been there so long that folks forget you were ever from some place else you can slip in. Yooper is not a derogatory term. It is a title worn proudly by those that can. I spend a lot of time up there but I know that I can never be a Yooper. The best I can do is Yooper wannabe, and earn the respect of the yoopers enough not to be considered a fudgie. I am however a Troll. The straights area of Michigan where the Mackinac bridge (pronounced mackinaw) is located, the narrow passage between Lake Michigan and Lake Huron, is famous for its fudge shops. Noteably the shops on Mackinac Island. Probably many of you have heard of Mackinac Island Fudge. Well, Fudgies are simply tourists that flood the area and into the U.P. every tourist season. They are not residents of or near the area. Whitepe is a fudgie. He does have reletives that have a place in the U.P. but problem is they are fudgies too, so whitepe ahould not be referred to as a simple fudgie, but more like a number 2. Some fudgies are trolls. Fudgie is a derogatory term, where as troll is not. A troll is a term for lower Michigan residents that live "Underneath the bridge" "Troll" of course a reference to the story Billygoat Gruff where the troll lives under the bridge. Here is a link to the yooper language. You need to remember that those Yoopers were there before tourist started bringing Greenbacks there way and got along just fine. I'm sure they'll still be there after the tourists are gone. Yup, more tourists simply means more road kill. whitepe, y'all spell that word wrong. It's damyankee. One word, one breath. Southren boys know it well. Which reminds me of a story. Y'all know why damyankees are like hemorroids? When they come down and go back up they are not to bad. But when they come down and stay, they are a real pain in the ---! Down here we have "the boat people". Highway 54 is a major route to the Lake of the Ozarks. In the summer months, every other vehicle on the road is pulling a boat or skidoo and has Illinois plates on it. Every third has Indiana or Ohio plates. Friday evening they are heading west. Sunday evening they are heading east. You'd think they didn’t have water back there. I live by and sail on the largest body of water in Indiana, Monroe Lake (not counting that bit of Lake Michigan around Gary). I can honestly say your observation that we must not have any water in Indiana is accurate - we have large puddles but no real water. . . Welcome to the Forestry Forum, Brenda. Fun, ain't it? Don, Hang onto those rains, son. Don't let'em buck ya off. Yup, Roadkill on north bound I-75 Friday and south bound on Sunday. I avoid the E-way at all costs weekends and when the weather is bad. The Fudgies can't drive worth a d#*! Some times they're also referred to as Flatlanders and Trunkslammers. These are some of the polite terms anyway. Yea, I know, I've been over many parts of Illinois and southern halves (I70 south) of Indiana and Ohio and I've seen water and beautiful hills. My statement was meant to be rhetorical instead of factual. I just can't see the attraction of pulling a boat 2-400 miles to the Lake of the Ozarks - or even going without one. Speaking for myself, we avoid the area like the plague - especially during the summer months. Looks like everyone is getting away from it all - all end up there. ADfields we had a guy in OH about 25 miles from here that killed his 12 year old son with a bow this year while deer hunting. He saw a patch of white out of his tree stand and shot it . Sad to say it was his son wanting to ask him a question.That was a month ago . But regular gun season in OH ended last Sunday and a slob hunter was arrested for shooting a passing white car . Again this sorry excuse of a hunter saw a patch of white and shot his shotgun. OOPS it was a car driving down a one lane country road on the other side of the brush. There is no excuse for this kind of behavior while hunting . I just cant bring myself to pull the trigger unless I'm 100 % sure of the intended target and what is behind it. I 've passed up some really large bucks cause they were in the skyline in a field. Well put Hillbilly,the same thing makes my blood boil.I went hunting Bull moose with a friend twenty years ago.On the second day,I heard a couple of shots and went over to his area.He told me he got a Bull,and it went in the water and died.It was floating with just it's ribcage showing.He wanted to leave it because it was to far out. I started to get suspicious,and insisted that he take the rope out and tie it around the horns.When he waded out to crotch level he lost his breath,and came back in.I handed him the axe and he fell a a Jackpine beside it and crawled out to it,whimpering the whole time.He called back "I can't find the horns" I said, surprise,surprise Jackass,tie it around it's neck and we'll drag it in. It was a Cow Moose,and he didn't admit it to me until years later,but he knew it before he shot it. I told him that day,and stuck to it "I will never hunt with you again." It was a long trip home. It's that kind of crap that makes it so hard for us to keep what little freedom we still have! Yooper's have some things in coman with big dumb birds I see. If you can't inspire them with information or dazel them with details, baffel them with Bull S#!t. Well it's fun to watch! Hay with enouf beer it could even be fun to try but without the beer it looks like PAIN! Up hear we get a bit stupid long about April first and do stuff like dress up like an outhouse and ski down a hill at 100 mile an hour into a pond of slush. Then the croud geves you points on your style in the air and how blue you are and what shap your hair can freeze into after you get out. :D NOT ME! I just watch!! Thay bo a beter job with a couple of beers to. Is the beer "Bush"or "Bosh"? heres a nuder one ah dem yoopers. Having "tailgate" soup exactly 40 years later! and that ski area doesn't exist anymore. A U.P. landmark, where was it? If that's you in the skiing picture,we would get along just fine on the ski hill. Well I posted on hear about the beer thay drink but it's GONE!! Jeff, you shure things are up to snuff? Beer's mostley Bud for the ones that land skis up like that. Now for me the once or twice a year I drink a beer I take Moosehead. In the bush thay make some booze that is fermented in an old jug out in the shed and I read in the paper from time to time how someones tool shed exploded from a bad batch of bush booze, the stuff explodeds no kidding! I'm headed for Yopperland tomorrow for a few days and will probably do some skiing, "right side up" though. My favorite uncle was a Yooper from up near Republic. 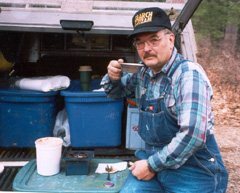 Not only was he a Yooper, he was also a Finnlander! I remember him telling me a story about when he was visiting his brother who was living out in a shack cutting wood and peeling spruce. They sat down to have some soup for lunch and my uncle's brother reached across his plate to grab some bread. His pitch-soaked shirt sleeve fell into my uncles soup to which my uncle said "Hey Benny your shirt sleeve is in my soup!" Ben's reply was "Ya dats ok - it's a dirty shirt anyway"
Thats a good one Mark, reading it I can still hear my neighbor Viner Eliasson (one true Yooper Finlander). He pasted away not too long ago at the young age of 99. Must-a been all dem Sauna's! I have to tell you another one about my uncle Myke, he was a really smart fellow who had a lot of “Fingenuity”, that’s what we called the unique creativity demonstrated by the Fins in Northern Minnesota. Sometimes ya just had to see to believe it. I had heard the term Yooper for a long time but it wasn’t just until recently that I found out what it meant. The other day I went to a web page that explained some Yooper terms and suddenly a whole bunch of things fit into place. My uncle wasn’t just a Finlander, he was a Yooper! My folks lived back in the woods and had a driveway about ½ mile long. Myke’s driveway was pretty long too and they always had trouble finding someone to plow snow. Myke decided to make his own snowplow so he fashioned this nice v-plow out of wood. Nothing too unusual about a wooden snowplow (I guess), but the one thing different about this one is he pulled it behind his station wagon! At first he had trouble with it whipping back and forth so he build a long rudder-like stabilizer that drug behind the plow. On the bottom of the stabilizer he had a metal blade made from a piece of old “misery whip”. This really “done the trick” as he would say and the snowplow tracked as straight as could be. It worked surprising well as long as the snow wasn’t more than about 4 inches deep and the car could still get through. When it was snowing hard he just went out every hour or so and drove up and down the road a couple of times. This worked great up until about the end of December when the snow started getting too deep and there was no place for it to go. I’ll always remember him driving around with this funny looking thing hanging out of the tailgate on his car, it made the car looked like it had wings. I guess this was pretty appropriate since Myke was a retired Navy pilot who flew in 3 wars. Page created in 0.852 seconds with 40 queries.